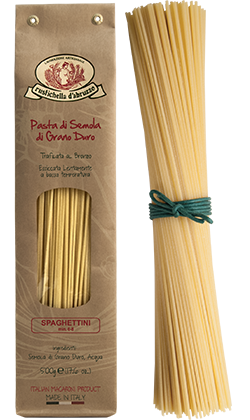 With a diameter between 0.85 mm and 0.92 mm, this type of "thin spaghetti" is among the most popular ones of Rustichella d' Abruzzo line, and combines well with a broth or a soup, or it can be stir-fried with a sauce made of oil, ginger, lemon zest and Sichuan pepper, or simply seasoned with fresh tomato sauce and basil. Cooking time 4-6 minutes. 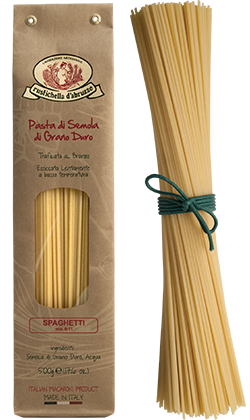 Shape of the same length of spaghetti but with a smaller diameter and thus shorter cooking time, Spaghettini pasta combines well with Rustichella d'Abruzzo fish sauces or simply with garlic, oil and hot pepper. Cooking time: 6-8 minutes. Spaghetti is the most famous and sold type of pasta which has become over the years the symbol of the Italian culinary culture as well as worthy representative of Italy abroad. There are plenty of combinations: from fresh tomato sauce and basil, a tomato-based seafood, through the classic condiments like "Carbonara" and "Cacio e Pepe" to the vegetables. Cooking time: 9-11 minutes. 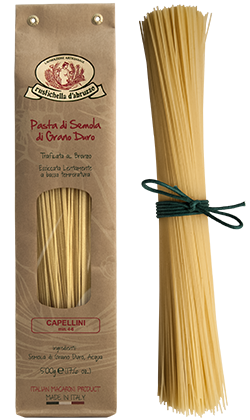 Exclusive type of Rustichella d'Abruzzo made with the best selections of Abruzzo durum wheat, the "Spaghettone del Leone" has a circular section of 2.6 mm, and it is bronze-drawn and dried at low temperature. 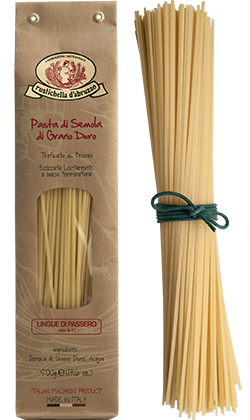 This Spaghetto is heftier and thicker than the classic one and the Spaghettone PrimoGrano, made to satisfy even more demanding palates. The condiments are represented from the best Rustichella d'Abruzzo sauces like “Amatriciana”, “Cacio e Pepe”, “Norma” and white sauce with porcini mushrooms. Cooking time: 14-16 minutes. 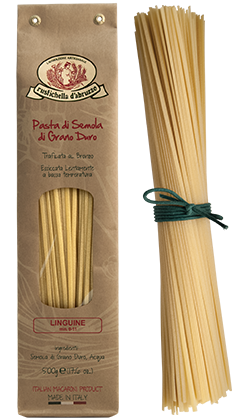 With same length of Spaghetti but with a rectangular shape, Linguine is one of the classic types of Rustichella d’Abruzzo line. 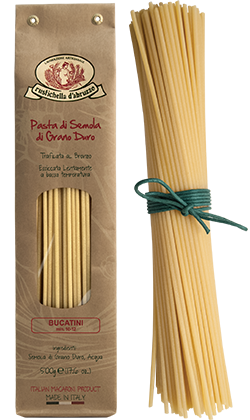 The bronze die and the low temperature drying process make the texture of this kind of pasta perfect for fish-based condiments such as seafood, shrimp and zucchini, or "pesto alla Genovese" Rustichella d'Abruzzo. Cooking time: 9-11 minutes. Shape similar to Spaghetti but with higher thickness and a square section instead of round, which is named after the typical tool used for its preparation (called indeed "chitarra"), which gives this pasta a firm texture that can capture completely the condiment, ranging from a simple but delicious tomato and basil sauce, to a more full-bodied and rustic one like sausage and radicchio or a “healthier” one like Rustichella d'Abruzzo "pesto alla Genovese". Cooking time: 9-11 minutes. 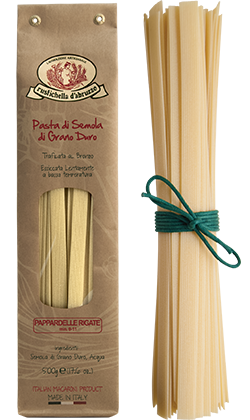 This shape is similar to Linguine but has a wider diameter; very well accompanied by condiments such as Rustichella d'Abruzzo "pesto alla Genovese", the "Mushroom cream" or "Puttanesca sauce". Cooking time: 9-11 minutes. Similar to thicker Spaghetti, they take their name from the characteristic central hole. It combines well with full-bodied sauces such as "Amatriciana" (made with pork or bacon and tomato), "Carbonara" and "Cacio e Pepe", without disdaining a fish-based condiment such as sardines and mussels, typical Sicilian dishes. Cooking time: 10-12 minutes. Made with durum wheat semolina and high quality water, this classic type of the Italian kitchen matches the "Bolognese” sauce, prepared according to traditional recipes with lean pork, veal and beef, minced meat cooked with slightly fried butter, bacon and herbs, cooked with broth, red wine and tomato sauce, and generously covered with Parmigiano Reggiano cheese. 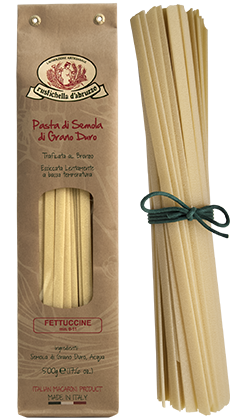 The Rustichella d'Abruzzo durum wheat Fettuccine can be seasoned, as an alternative to the meat sauce, with porcini mushrooms and truffles, seafood, bacon and peas. Cooking time: 9-11 minutes. 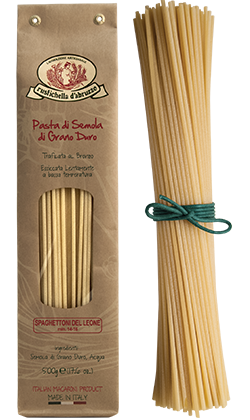 A type of pasta made with durum wheat semolina and high quality water, similar to Tagliatelle but with a higher thickness and with a line carved on the surface that allows better absorption of the sauce, it goes well with red meat sauces such as wild boar, with mushrooms or just with fresh tomatoes and basil. Cooking time: 9-11 minutes.